I Upset Things. It’s my job, it’s what I do! This story comes from the people of the Pacific Northwest. A people closely linked with the sea. It is a tale that explains the tides. My favorite parts of the story are when the lines, “It’s my job. It’s what I do!” are said by Fog man, The Man who sits on the Tide, and finally by Raven. Each character knows their part in the over all plan. Each of us also wants to fit in and be part of an over all plan. For some of us, knowing what our job is isn’t the easiest thing to figure out. 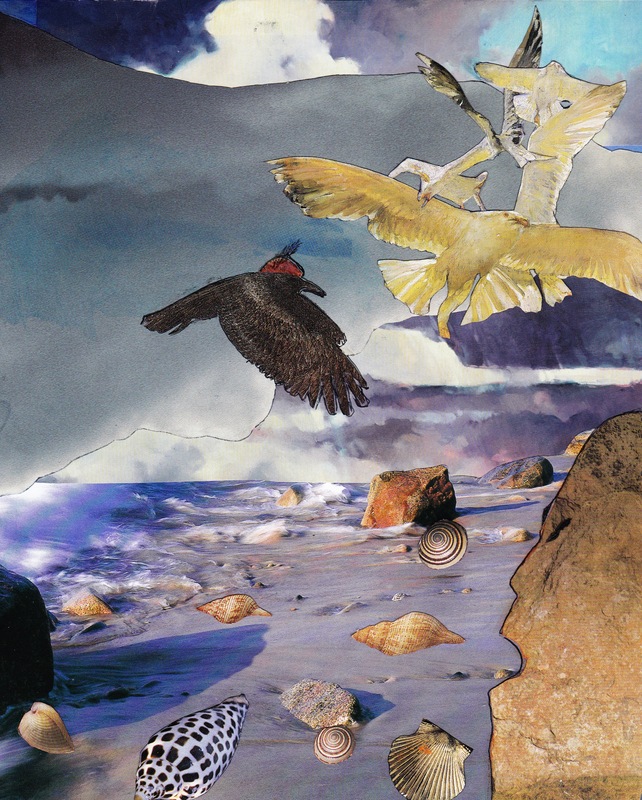 The seagull in my collage symbolizes “not knowing.” He is about to land on top of the head of the giant that sits on the tide. In the Tale, Raven asks Seagull if he knows how to move the water out of the way, but Seagull does not reply because he is busy searching for answers himself. In some indigenous cultures, you are given a name that explains what you do. In our Tale, the person who makes fog is called the Fog Man. Early on, many surnames came from what the person did. For an example, Shoemaker, Schumacher, let us know that the person made shoes. The person named Fletcher was the individual who puts the feathers on arrows so they fly straight. Today, our name rarely represents how we fit in. Today we have to decide for our self. Yet, we are still judged by what we do. Most of us realize that there is more to who we are than how we earn a living. Raven and Seagull are the main characters in another story. When the great creator created things, he kept them separate in Cedar boxes. The boxes contained such things as mountains, fire, water, wind and seeds for all the plants. One of the boxes was given to Seagull who decided not to open his box. All the animals tried to get him to do so but he refused. The animals called upon Raven to get Seagull’s box open. Raven tried reasoning with Seagull, but that didn’t work. Next he tried to trick Seagull into releasing the box, that to failed. Finally, Raven was so angry that he stuck a thorn in Seagull’s foot. Seagull dropped the box and the lid fell off. 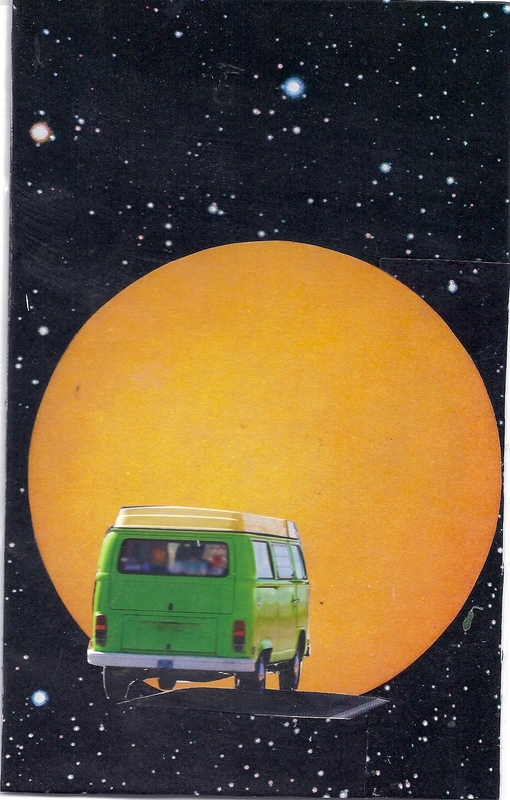 Out came the Sun, the moon and the stars. This brought light to the world and allowed the first day to begin. Raven is an old friend to me. I wrote a story that had Raven as an important character. He acted as a go between people and the gods. He is the one that blithely goes forward believing in the future and his role of happily discovering it. I loved the trickster. Unlike the primary gods who make something out of nothing and get the whole shebang rolling, Tricksters create from prima materia – the primary materials of this Earth. In this role they are the first artists, fast change artists to be exact, for change is what they create. This story from the Pacific Northwest is full of fog and the sea. It tells the tale of how Raven created tides. The surge and ebb of the sea usually occurs four times a day, though some places experience it only twice. The Moon’s gravitational pull is the principal mover of tides, but the Sun, deep sea tides, the Coriolis effect and varying depths of water near the shore all contribute to different level s and frequencies. Yet, even with today’s technology accurate tide depths are not easy to predict. The sea remains a mysterious fascinating force and so does Raven. His heavy wing beat and raucous cry never fail to send shivers of awe down my backbone, especially on a foggy beach just as the tide begins to turn. Fog can be a symbol for doubt and confusion but it can also be a warning that some knowledge is best kept hidden. It can provide a hiding place or refuge, but it can also facilitate loss or conceal lurking danger. Fog muffles sound and plays tricks with direction and acoustics. In films, fog is an ominous harbinger of change for the worse and sometimes symbolizes evil itself. Fog and Trickster make a very good match. And in this story there are. The Man Who Sits On The Tide is gigantic enough to stopper a hole in the seabed that allows the ocean to empty. It seems like an important job. Disturbing him could have grave consequences. Yet raven attacks this giant with impunity. He employs two natural resources, fog and pain. Wielding them with wit and determination he trains the giant like one of Pavlov’s dogs. This is Trickster at his finest, creating profound change for the benefit of all, including him. 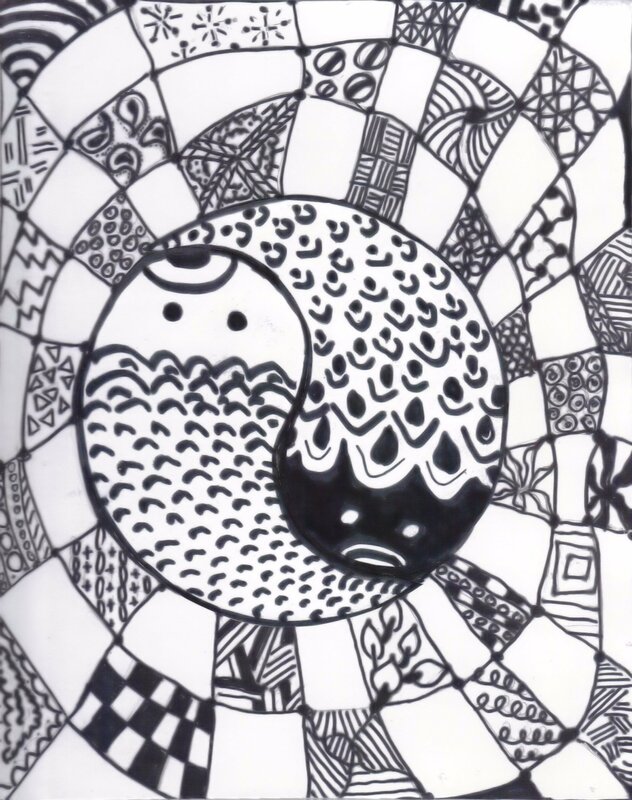 Black and white, held to be polar opposites, both contain within themselves diametrically opposed meanings. White can be cold, sterile, barren, the color of funerals, grieving and death, Black can represent decay, despair, sin, funerals, grieving and death. White can be purity, spiritual ecstasy, new; death can be fecund, rich, warm, the source of the divine spark of life. No wonder the Chinese married these opposites into a timeless symbol of wholeness – the immediately comprehensible Taijitu. The moment one sets eyes on this figure one knows what it means. Two opposing, yet complementary flowing black & white figures, each containing a piece of the other, fit together to form a complete circle. The inextricable oneness of yin (feminine) and yang (masculine) is obvious, especially to a Jungian who can easily perceive the anima and animus in the contrasting dots within each figure. The two halves of the circle resemble fish and people have been running with that association almost since it first appeared. When I considered the black and white prompt for a story about out-of-balance femininity and masculinity involved with a fish, the Taijitu figure was a no-brainer. I decided to enclose my fisherman and his wife in an entangling net to represent how stuck they were in their marriage, their poverty, their assumptions, etc. The story of the Fisherman and His Wife disturbs and intrigues. It affects us. So, the net also represents the world net of Shiva, which one cannot touch without setting off vibrations that echo through the cosmos. Just as in the story, though it isn’t mentioned per se, all the changes effected by the wife and fish touch on hundreds of lives. AHA! I do believe I’ve just unraveled the meaning of those staggered, stepped maidservants, soldiers and flames, which so puzzled me. I had great fun making Zen tangles out of the squares of the fish net. I used a Sharpie marker to draw them and the fish. The lines are rough and crude without the definition of a fine-tipped pen, because the story is kind of rough and crude itself. The tangles represent the changing nature of the sea – its many moods and manifestations. They also stand for the shape-shifting nature of the fish who is also human. The Taijitu figure is derived from an intricate system of solar measurement used to determine the calendar. 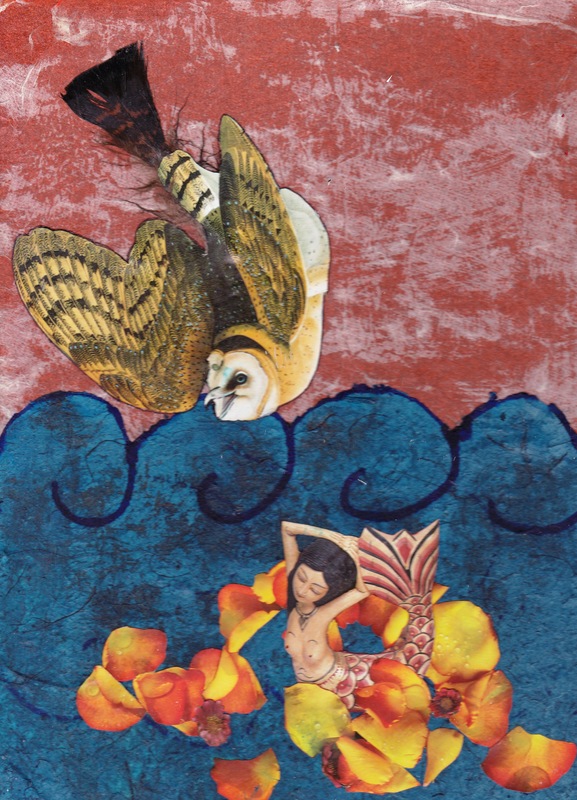 In my collage, along with the other meanings, it refers once again to the unchanging change nature of the natural world. 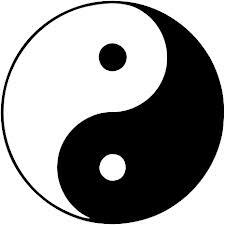 The whole philosophy of Taoism rests on an idea inherent in this symbol – the complementary nature of opposing components. It is also the basis for the system of divination called the I Ching. 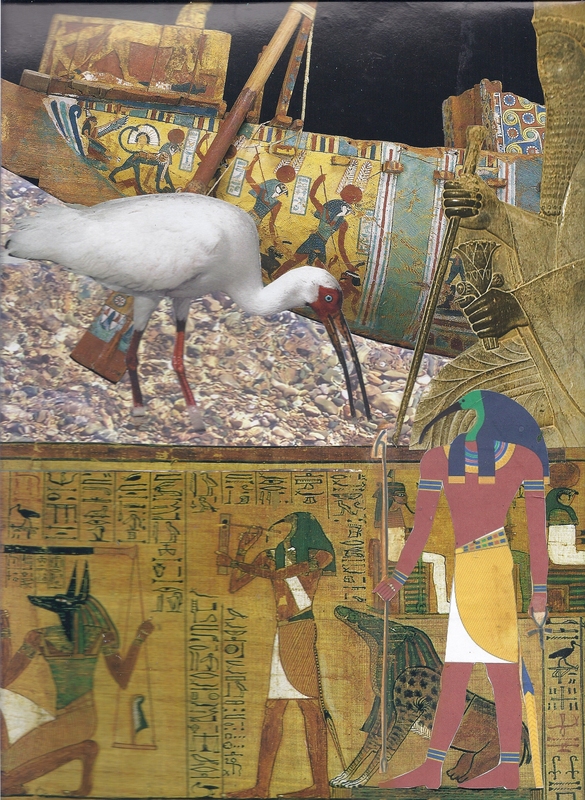 So it is appropriate to use it to represent both the universal nature of storytelling and the divinatory way in which we use collage to reveal hidden meanings in our lives. I’m very grateful to Leah Piken Kolidas of Creative Every day for sprinkling a bit of magic on this site with prompts that always send us in new directions. There are several things to like about this story. I liked the fisherman calling to the magical fish. The chant he uses is the same each time. I like that the Fish/Prince always comes. I also like the idea of a Magical Fish and wondered what an enchanted Prince would look like as a “special” Flounder? Any one who has ever gone shore fishing at the Ocean or Sea knows that it can be cold and damp, especially in the early morning or as in our story, at the end of a long day. While sitting and waiting, watching your fishing pole, listening to the sounds of the surf, trying to keep warm it is easy to wonder what kinds of fish live in the deep waters. When the fisherman catches the talking fish, we know the fairytale has begun. The fish tells the fisherman that he isn’t an ordinary fish but an enchanted prince and he demands to be returned to the sea. I was surprised when the fisherman gladly complied. Perhaps the fisherman, who was trying to catch something to eat was befuddled, unable to make a mind shift from eating to a talking fish, so he let the fish go. This gave me pause. Why wouldn’t the fisherman be fascinated by a talking fish? The Fisherman is a dullard. On the other hand why didn’t the Prince/fish thank the Fisherman for giving back his life? In fact throughout the story no one is ever thankful, not the fish, not the fisherman, not the wife. The fisherman on occasion says something to his wife about being satisfied but he never thanks the fish nor apologizes. Perhaps this tale is all about gratitude. 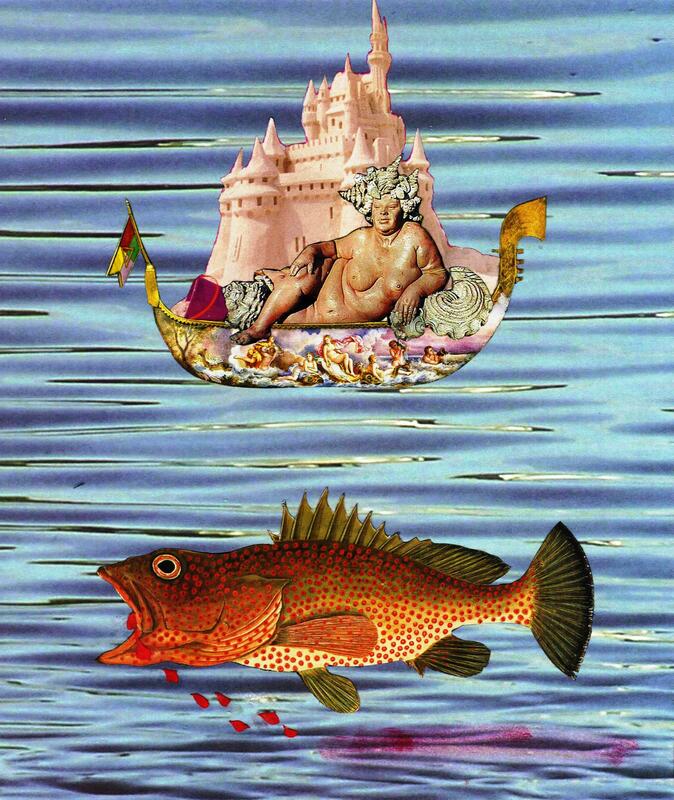 Perhaps the reason the Fish Prince was turned into a bottom feeding fish, a Flounder, because he was not grateful. There is a sense of entitlement shown by the fish and by the greedy wife. At first when the wife insists the Fisherman go back and ask the fish for a small cottage to live in I wondered if the fish’s magic could comply. Like the genie in the lamp or the leprechaun caught by a human the question becomes will the wish be granted, will there be some kind of trick. or is there a loop-hole that makes the discovery of the magical one null and void? The story ends as it began, “O man of the Sea, hearken unto me. My wife Iisabill will have her own will, and hath sent me to beg a boon of thee!” And the Fish Prince replies, “Well, what does she want now?” After the fisherman tells the fish of his wife’s demand, the fish’s reply is the same, “Go home” he tells the Fisherman. But now the change … “Go Home to your pigsty again.” Finally! It isn’t until the wife asks to become a God that the Fish Prince puts down his foot. All the wife’s gifts are forfeited, the husband and wife are sent back to square one where they started. The ending line, “And there they live to this day,” clearly implies, game end, enough is a enough, story over.